Whose Broad Stripes and Bright Stars? I dunno. | Lord...What's My Motivation? « TOP 20 GREATEST COMEDIES OF ALL TIME! Whose Broad Stripes and Bright Stars? I dunno. First and foremost…I’m no political scholar. I don’t even pretend to know what the “ins” and “outs” of a Presidential campaign race involves. But, I do know this, I’m a human being who likes to think he’s incredibly aware of characterization, commitment and drama. That combined with a genuine, luke warm overall understanding of the economy, mixed with love of THE DAILY SHOW and the COLBERT REPORT re-runs….let’s talk politics. I was raised Presbyterian, I lived in Michigan in a two-story white house with red shutters…my family was Conservative, and Republican. I know all of these things because my parents told me so. We lived the wonderfully passive 1/4 acre backyard, picket fence, sunshine and lollipops life. We didn’t smoke…we didn’t drink (except for the dreadfully sinful shot of Kahlua in mother’s coffee)…and we watched the news like everyone else did. We kinda didn’t care about stuff. You know…political stuff. Fast forward about 25 years or so. I’m a red-blooded High School teacher, a total drama geek, whose goal in life is to offer all that I can with my talents and passions on this earth as a God-fearing man. No picket fence…lots of sunshine, few lollipops, and I don’t smoke. I love Jesus, and the occasional glass of wine is not uncommon. I’m Lutheran. While a few things have changed, and I argue that my childhood was passive enough for me to refer to it as “largely swept under the real-life rug,” I have taken an active stand in relocating my personal position on many, many things including politics. These two candidates are really something, aren’t they? It never fails. Every heated Presidential race pits two wild and crazy guys against each other. Wild and crazy because we end up finding out ALL about them…and in some case more than we would ever want to know about them. I think Barack is very charismatic. I think he could sell an igloo to an Eskimo. I also think he has some great ideas. (After all…I love change. My classroom is in a constant state of flux.) I think he’s sharp, poignant, and could certainly win the Presidency on theatrics alone. Do I think he’s the right man for the job?…..ummm. Maybe. 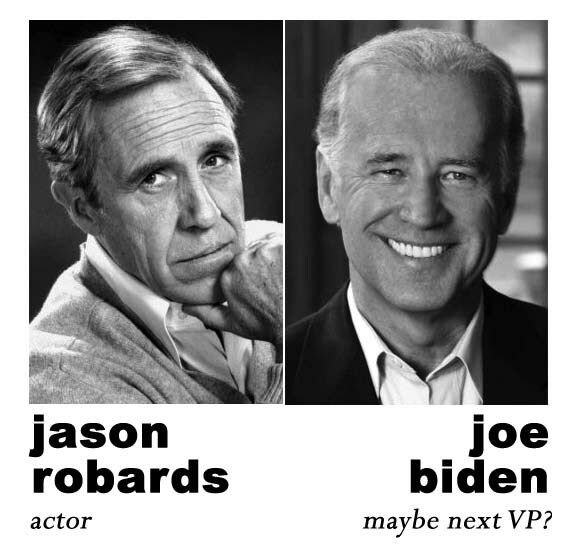 Maybe not. McCain is forceful, strong and he’s got the POW card goin’ for him. (There are a lot of registered veterans out there.) I think his experience in the military is a bonus. There is a lot of talk about his health. I don’t even think about that. Until he starts mumbling and drooling at the podium, I think that should be off the table. No one talked about Michale Jordan’s worth as a ball player when he was injured. They just wanted to know when he was going to get back in the game. Is McCain the Michael Jordan of Presidential candidats, though? I don’t know. This particular political race has got me cornered. I know that whatever happens, history will be made. We’ll either have the first African-American President in office, or the first women Vice-President in office. (Ha ha, Hillary….silly. Married to Bill……heh. Hill and Bill. What a sideshow they are!) So…this is a biggie. It doesn’t seem that either candidate has firm beliefs. Or do they? They both claim to be Christians and attend church. Both have gone on record to say they “pray everyday.” McCain says that he doesn’t attend church as often as he would like, but many, including his own pastor, attest that he is a devout man. Obama was raised by a mother who exposed him to numerous religions and he is very quick to point out his father, a “one-time Muslim” was a self-proclaimed atheist at the time of Obama’s birth. Navigating through both of the candidates websites, I found numerous resources that will convince me that each party is sincerely the lesser of the two evils…because we all sin. Is that enough? As I walk to my classroom tomorrow…worried about making it to payday Friday, wondering if I should make a dentist appointment, anticipating the dedication of the school’s new theater, wondering if I’ll get all my grading done, hoping the new Advanced Drama lesson is effective….needing, worrying, hoping, mourning, trying…I look forward to a combined effort in all of my planned and unplanned future happenings. I need the support of my Lord to get through things. The “WHY”….not the “WHAT.” That’s what is missing from both candidates. I don’t want to know what they believe. I don’t want to know that they are Christians, and here’s the proof. I don’t need to have that info. I would rather they exemplify the Christian walk. I’d rather them demonstrate Christ-like behavior instead of bookmark the perfect, motivational speech and “wow” a crowd with their charisma. I’d rather them demonstrate their relationship with the Lord, after the trials of a lifetime of trying to find Him. Arrrgh. This is why I hate politics. I tell my acting students this all the time. Politics is drama. Courtrooms are stages. Debates and speeches are scenes and monologues. It’s ALL farce. We all nominate and vote for actors. It make me almost not care. It’s a similar feeling the second after the Best Actor or Actress wins an Oscar…whoever wins, everyone moves on. Where’s my invested interest in it? (Which is a very dangers thing to say.) Where do they stand? How can anyone ever know? It’s mor than a drop-down menu on a website or a political sound bite. The media will squeeze every last drop of truth out of each candidate and twist them in to whatever shape they like. Well…pretty soon the horse and pony show will be over and we’ll go about our days either content or grumbling. Either way, we’ll all go about our day. You know what…that’s the thing…either way, we go about our day. When Jesus died on the cross…I wonder if the crowd of people who witnessed the crucifixion simply went about their days afterward. Seems unlikely. Even for the unbeliever at that time. 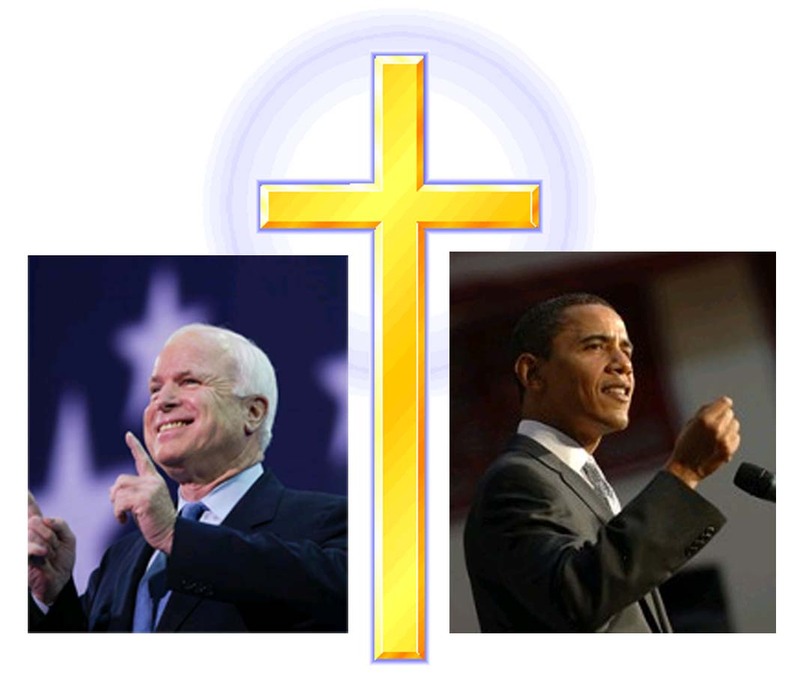 While this year’s election should probably not be compared to the crucifixion (depending on who you ask)…I do think that Jesus died for both Obama and McCain. I do believe that the Lord wants both men in heaven with Him. I’m just not convinced yet that both candidates know that. Politics and religion…sometimes are viewed as oil and vinegar. But, I can’t help but think that the leader of the free world should be a strong, confident, vocal, God-fearing sinner who doesn’t offer long-winded explinations as to why he was raised the way he was. It shouldn’t be a man who sits behind the youth choir during church because it provide an easy escape route after the service so they can remain largely unnoticed. I think our President should lead worship. They should quote scripture instead of talking about it, as if it were a WWJD bumper sticker. I look at this position as the HEAD…the EXECUTIVE DIRECTOR….the NUMBER ONE MAIN DUDE in charge of everything in America. This includes religion. They should be the SPIRITUAL LEADER of this country. I’ve yet to see either man with a Bible in his hand. I pray for this and every Presidential race. Not because I don’t believe in the candidates. But, because I believe Jesus Christ is my savior. And if either of the candidates is twisting…even slightly…their personal walks with the Lord, for the sake of garnishing that one extra vote, then I might just have to stay home that day. I suppose it’s the principal of the thing. I don’t want either candidate to sacrifice their own souls for the sake of a vote. No mere job is worth that, no matter how big and white the house is. Each candidate will tell you everything about them. Where they were born, how they were raised. I’m pretty confident neither will offer their stand on Kahula in coffee, but I know they will be able to tell you, in fancy-dancy words, how they live their lifes in great detail. But I’ve yet to hear a candidate say what they are doing so that they can prepare for their death and the life in the world to come. I guess I’ll have to wait until election day. I’ll put “voting” on my list of things to do that day. If that’s passive, so be it. But, until a candidate offers me more than a mere PDF document containing quotes and positions on Faith, I’ll have to say that Democrat or Republican…Conservative or Liberal…black or white…grande or Venti….I’m just a guy who loves the Lord, and I don’t think a bad thing to want to vote for a dude that feels the same way. I wonder what George W. Bush’s church-going schedules will be like the days after the elections. I hope he doesn’t chalk up his position as SPIRITUAL LEADER as a “swept under the real-life rug” kinda thing. This entry was posted on September 22, 2008 at 8:09 am and is filed under FAITH, FAMILY and FUN, LIFE IN GENERAL / RANDOM RAMBLINGS with tags election, Faith, faith-based, mccain, obama, opinion, President, Presidential, religion, voting. You can follow any responses to this entry through the RSS 2.0 feed. You can skip to the end and leave a response. Pinging is currently not allowed.